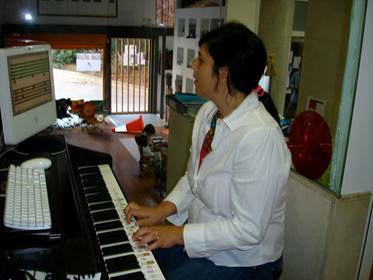 Some of our Gentle Piano Software™programs (eyeNotes™, Guess Key Game) require the MIDI connection of the computer to an electronic piano keyboard or a digital piano. An external digital piano or keyboard with MIDI feature or a MIDI keyboard. An adapter to connect the digital piano to the computer. *MIDI is a special protocol for interaction with MIDI devices and producing music sounds. A USB MIDI Interface to connect the USB computer port with 5-pin MIDI output/input sockets of a piano/keyboard. You will need to install on your computer a device driver located on a CD supplied with this MIDI Interface. Some digital pianos and electric piano keyboards can be directly connected to the USB port of the computer using a USB cable, but you still have to install a device driver from a special CD that comes with the piano keyboard. The piano keyboard has to be GENERAL MIDI compatible! To find it out, read the piano keyboard manual. Check for the word "MIDI" on the piano keyboard front, or look for a pair of round 5-pin sockets, "MIDI In" and "MIDI Out," at the back of the keyboard. If not directly specified, connect the cable In plug to the Out MIDI socket of the piano keyboard. Connect the cable Out plug to the In MIDI socket of the piano keyboard. For a stable MIDI connection, we recommend that you connect all MIDI cables and devices before you switch on your computer and piano keyboard. Also, we recommend that you first switch on your computer, and then the piano keyboard.